You are here: Home / Charlottesville / Popeyes Chicken Coming to 29? Popeyes Chicken Coming to 29? A Popeyes restaurant (I assume it’s Popeyes Chicken) is coming to 29. Located between the existing Kentucky Fried Chicken and Raising Canes Chicken, Popeyes will be opening on one of the busiest, and often times most challenging parts, of 29 southbound. I have been wondering for months what was going in that building, both for curiosity’s sake and as I have a personal connection to that building (it is the site of the former Century 21 Manley – where I started my real estate career). There’s also a “Bring Popeyes to Charlottesville” Facebook page. Who knew? Those from the “Bring Popeyes to Charlottesville” group announced this a long time ago, as we noticed the sign in the window early Febreuary as well as a Popeyes van in the parking lot. Any idea of its opening? Because the fourth healthiest county in the state needs another fried chicken restaurant and add more low paying food service jobs to the area. How many of these new employees will be hiring Mr. Duncan to purchase a home in the area? Let me guess, zero. What a grouch. You don’t have to eat Popeyes, nobody’s forcing you too. It isn’t only about the fried chicken, it is about quality jobs. Give it a rest, it’s actually fine for you if you take the skin off, like I do. And their selection is nice a eclectic, the music they typically play is awesome, and the side-dish options are really not that unhealthy at all. 3 fried chicken restaurants right next to each other? 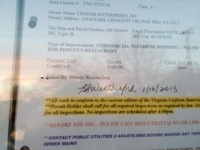 I am also lamenting the low paying job creation this restaurant is bringing to cville. Cville and Albemarle needs livable wage jobs.